The Phillies' infielders were mandated to practice at 3:55 p.m. Wednesday, the first day back from a long road trip. Yet another starter was missing when t he group reached the Citizens Bank Park grass. Michael Young left the team because of a family matter. He will miss at least three days. More pressing was the revelation that Chase Utley's strained right oblique was slower to heal. The team's original — and optimistic — time frame of 15 days without Utley is unrealistic. 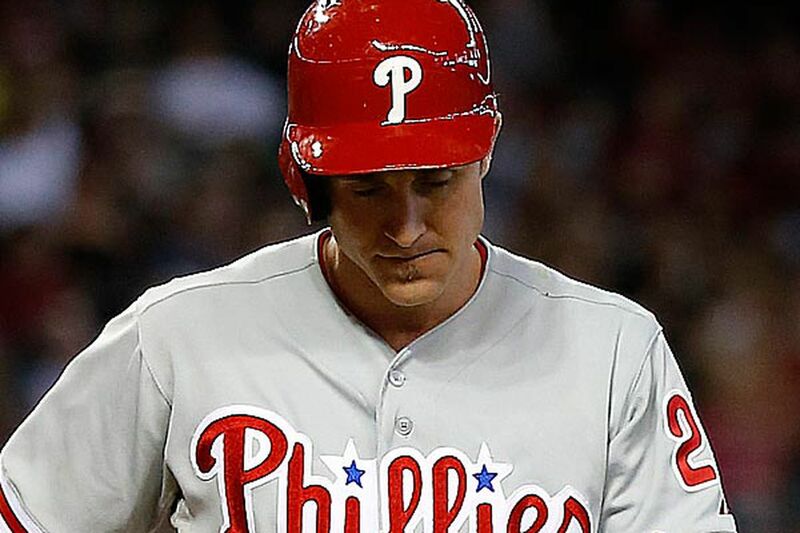 Phillies general manager Ruben Amaro Jr. said Utley had not suffered a setback in his recovery. Utley is expected to return in mid- June. The second baseman worked with an athletic trainer before Tuesday's game at Fenway Park. He was nowhere to be found Wednesday. He could take ground balls Thursday. The bigger test is swinging a bat. "It's just tricky, so we have to be real careful and cautious," Amaro said. "I still think he feels tenderness in there, so we've got to be careful to not let it get to the point where it becomes more of an injury." Utley said that himself, even when the 15-day timetable was established by the team. He has never suffered an injury like this to his midsection. He solicited the advice of players who did and their message was: "Don't rush it." Manager Charlie Manuel said his understanding was that the injury to Utley's right side could take up to a month to fully recover. The Phillies expect a similar timetable for catcher Carlos Ruiz, who is progressing from a hamstring strain. With the news about Young, the Phillies were rendered shorthanded in the infield. Freddy Galvis shifted to third base, with Kevin Frandsen at second. Prospect Cesar Hernandez was recalled from triple-A Lehigh Valley and arrived from Rochester, N. Y., around the first pitch. Hernandez, 23, was hitting .308 with an .815 OPS at triple A. He had six triples, two home runs and 15 stolen bases in 48 games. The Phillies consider him a future major-league player and due diligence is required — Hernandez will be out of options in 2014. His stay in the majors could be brief. Young must miss a minimum of three games while on the bereavement list. He can be absent for a maximum of seven games. Hernandez pinch-hit in the seventh inning and flied out to center. Reinforcements to the Phillies rotation are coming, but the process is slow. John Lannan faced hitters in a simulated game Wednesday in Clearwater, Fla. He will pitch in extended spring training once more with the hopes of starting a minor-league rehab assignment June 6. Veteran Carlos Zambrano, who pitched 41/ 3 scoreless innings at single-A Clearwater on Tuesday, will require at least three starts before he can contribute, Amaro said. Boston will not start ace Jon Lester as scheduled Thursday. Instead, lefthander Franklin Morales will make his 2013 debut. The Red Sox altered their rotation again because of Clay Buchholz's shoulder injury. ... Pitching prospect Adam Morgan has a shoulder injury that concerns the Phillies. He was seen by the team's doctor Tuesday and results were not immediately available. Contact Matt Gelb at mgelb@phillynews.com. Follow on Twitter @magelb.